LOGAN, UTAH–Today we hiked up part of Logan Canyon along the south side of the Logan River. Towering above us on either side were massive limestone cliffs, as shown above. The thickest unit is the Lodgepole Limestone Formation (Lower Carboniferous, Tournaisian — about 350 million years old), which is well known throughout the northern Rocky Mountains. I’ve long admired its extent and consistency. It testifies to a shallow carbonate platform that extended from what is now Utah, and Colorado up into central Montana. In fact, correlative carbonates by other names are found from Arizona (the Redwall Limetone) well into Canada. I’ve also been impressed with those many paleontologists over the past century and a half who have managed to pry fossils out of its concrete-like matrix. When they do they have beautiful bryozoans, brachiopods and rugose corals. Some of the best are silicified and removed by dissolving the calcitic matrix from around them. View of the northern side of Logan Canyon, Utah. The Lodgepole Limestone Formation makes up the major cliff on the right. The Lodgepole Limestone Formation is part of the Madison Group of mostly limestones and dolomites. Most of these rocks are affected by karstic weathering, so the terrain often has disappearing streams, sinkholes and caverns. While the carbonates of the Lower Carboniferous were being deposited in western North America, mixed siliciclastics dominated the east. Last semester’s Sedimentology & Stratigraphy class studied some of those rocks on their field trip to Lodi and the southern edge of Wooster, Ohio. It is always fascinating to look at very different sediments deposited at the same time in different places. 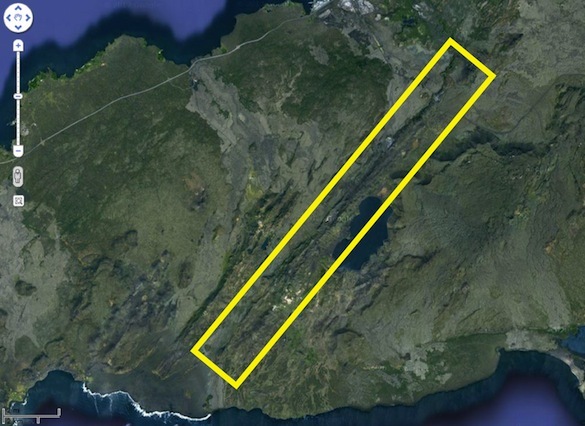 ICELAND – Team Iceland is investigating the formation of subglacial pillow lavas on the Reykjanes Peninsula in southwest Iceland. Google Earth image showing the elongated pillow ridge that we are working on. The pillow ridge erupted along a fissure system when the peninsula was glaciated. 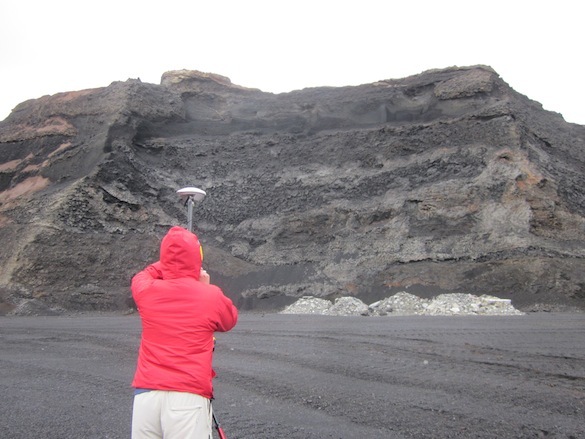 Quarries along the ridge expose the internal structure of the subglacial deposits, revealing complex sequences of pillow lavas, intrusions, and fragmental units. One of the active quarries graciously allowed us to use their break room for a morning overview. We spent most of the rest of the day working in the inactive part of the quarry. 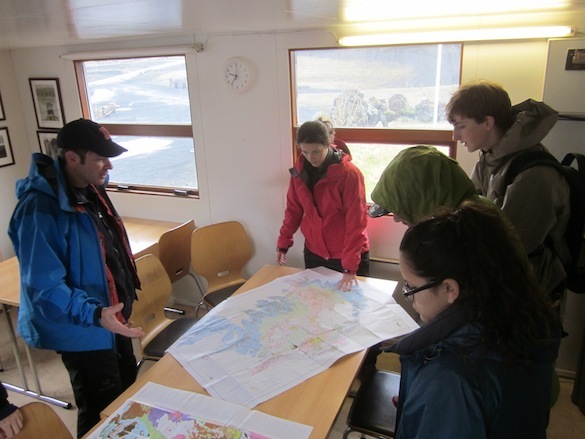 Team Iceland examines the base of a wall of pillow lavas and discusses the formation of hyaloclastite, the glassy fragmental material that spalls off the pillow rims. As we explored the walls, we found a lava cave. 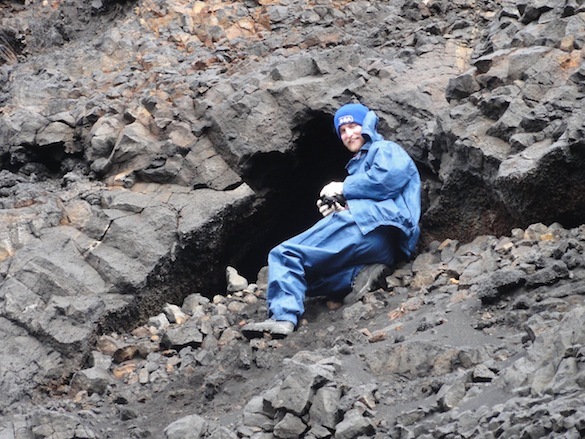 Alex Hiatt (’14) snapped a photo of the hibernating lava bears for Dr. Wilson. 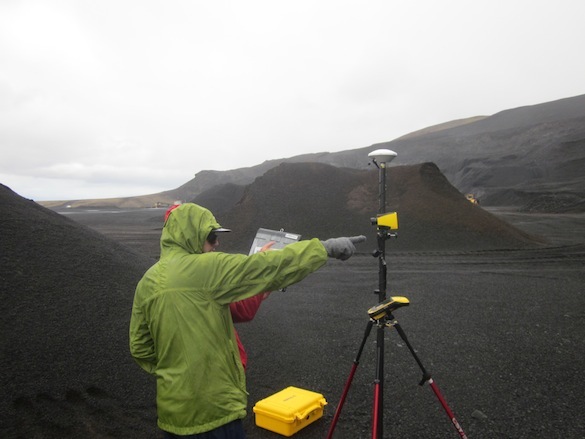 Aleks (’14, Dickinson) uses a GPS and a laser range finder to “shoot” the quarry walls. Adam Silverstein (’16) points out features on the wall for Aleks to shoot. The day ended with some reconnaissance work in the active parts of the quarry after the workers had left. 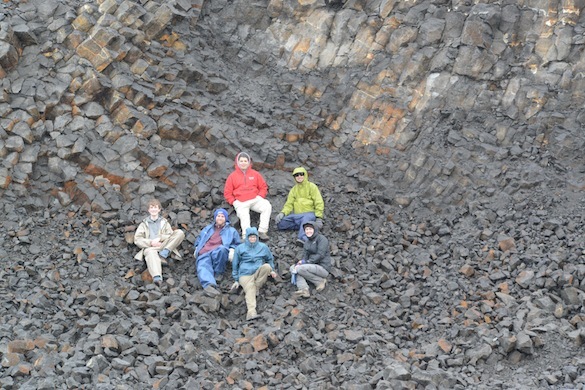 Team Iceland poses with a a fantastic columnar jointed basalt they found on their reconnaissance investigation. 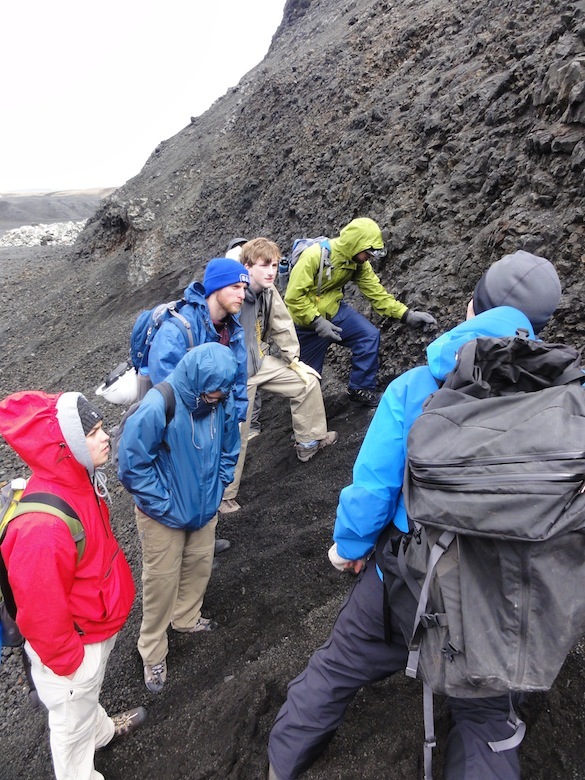 This week we highlight another gift to the Wooster Geology Department from George Chambers (’79). 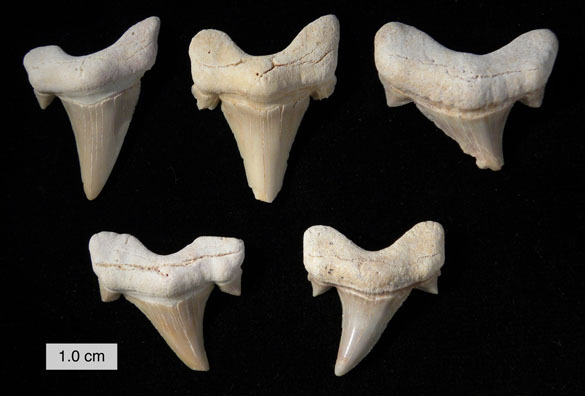 Among the many fossils that arrived in three delightful boxes were these shark teeth. They are from the extinct Mackerel Shark Otodus obliquus Agassiz, 1843. They were collected from the Eocene of the Khouribga Plateau in Morocco. These shark teeth are rather common, although they are not often available in such fine preservation as these. What intrigues me is how they are collected and placed on the market. The Khouribga Plateau, west of the Middle Atlas Mountains, has some of the largest phosphate deposits in the world. These phosphorites (phosphate-bearing rocks) are mined in open pits by dynamite. After a blast, local commercial collectors rush in to gather fossils in the rubble before large processing machines arrive to process the ore. That can be a matter of minutes. They find many, many fossils in this phosphatic debris, mostly of reptiles and fish. The lamnoid shark Otodus obliquus, a reconstruction of which is above, was a very large animal with some teeth over 10 centimeters in length. It may have been up to 9 meters long. 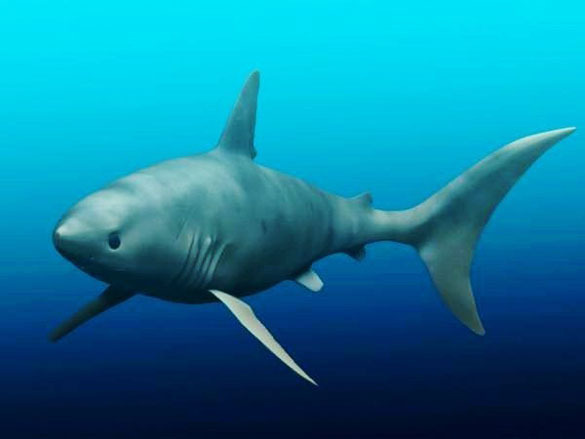 Otodus obliquus was a “macro-predator”, meaning it was at the top of the food chain with a likely diet of marine mammals, fish, and other sharks. Its remains are found throughout the world in Paleocene and Eocene sediments. 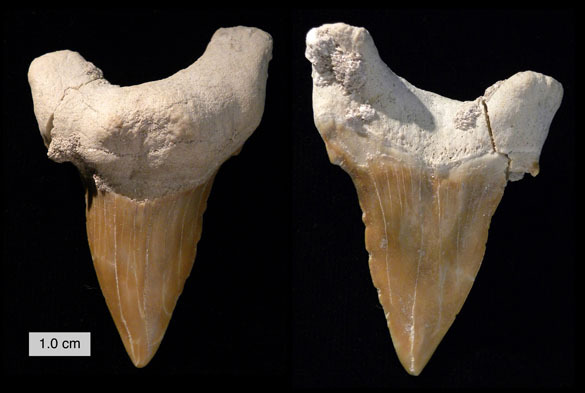 The fossil evidence suggests that this shark is an ancestor of the massive Carcharocles (“Megalodon”). Thank you again, George, for these beautiful fossils! Agassiz, L. 1843. Recherches Sur Les Poissons Fossiles. Tome III (livr. 15-16). Imprimérie de Petitpierre, Neuchatel, p. 157-390. Arambourg C. 1952. Les vertébrés fossiles des gisements de phosphates (Maroc-Algérie-Tunisie). Notes et Mémoires du Service Géologique du Maroc (Rabat) 92: 1-372. MacFadden, B.J., Labs-Hochstein, J., Quitmyer, I. and Jones, D.S. 2004. Incremental growth and diagenesis of skeletal parts of the lamnoid shark Otodus obliquus from the early Eocene (Ypres) of Morocco. Palaeogeography, Palaeoclimatology, Palaeoecology 206: 179- 192.